It’s no secret supper clubs are the new black, rising fast in popularity as an alternative to the typical restaurant dining experience. The underground restaurant concept allows diners the chance to try new foods and meet new people, all within the confines of a more personal space than can be offered by a traditional restaurant space. Thankfully there’s been a rise in the number of vegan supper clubs as well, including a couple backed by friends. But the friendship isn’t why I’m about to promote them so heavily; regardless of who backed these events I would still attend, based purely on the fact that the food is great. 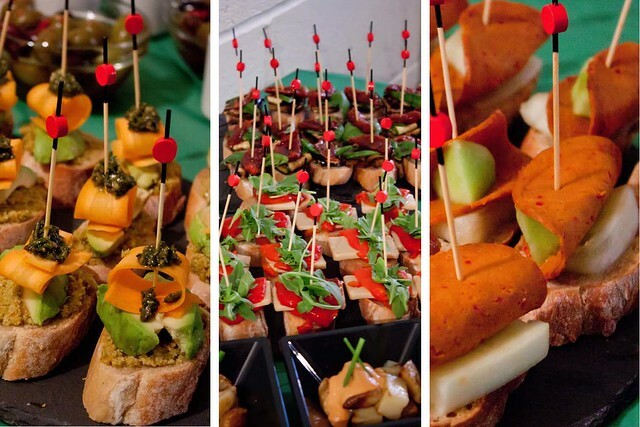 Vegan Peasant, run by Diana and Adrian, is an East London based catering company that dishes up a whole line of different bites. I’ve enjoyed their canapés before at The Third Estate launch and have sampled their market stall food, so I knew their tapas would not disappoint. Pesto de albahaca y tapenade, piquillo con Manchego, and chorizo con melon pintxos. 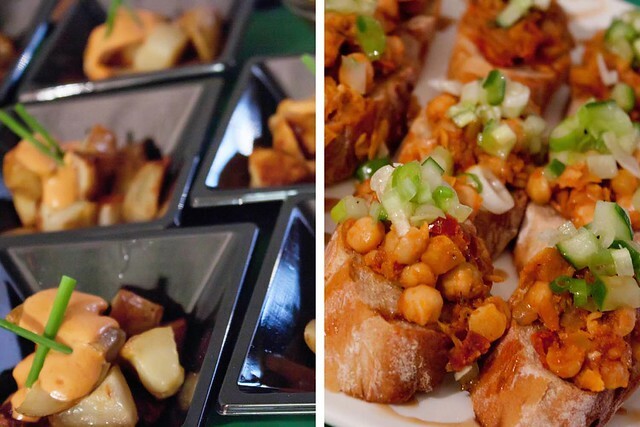 I loved the relaxed atmosphere of this event, a perfect time and place for tapas. Wine, food, more wine from my handbag, more food, more wine from my handbag. Delicious. I look forward to more from these guys. To find out about Vegan Peasant, including details about market stalls, contact them on Facebook or Twitter. For a more in depth review of the event, please check out my write up on fatgayvegan.com. Jhenn, of Little Bird Suppers caters to those looking for unique niche vegan meals, often foods many people may not have ever encountered. Last year she put on a Thanksgiving feast (which I’ve heard was absolutely mindblowing) and has followed with her increasingly popular Japanese lunches. 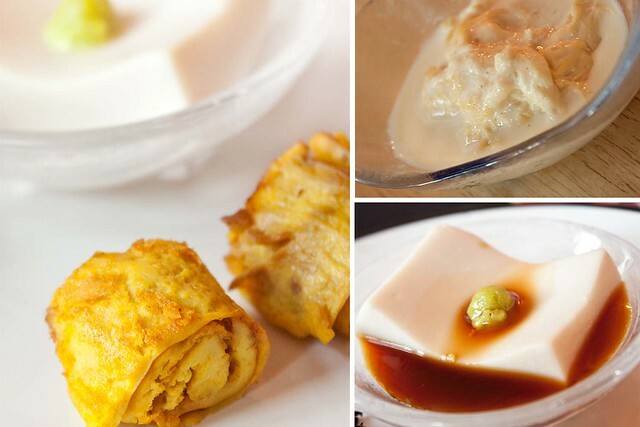 The initial dishes of the night were light appetiser like plates, including the deliciously eggy tamagoyaki rolls and fresh yuba (which I absolutely adore – here’s a sort of recipe for yuba). And don’t get me started on the gomadofu. If you’ve never had it then go buy some kuzu starch and make some immediately. Both Jhenn and her partner Ed previously lived in Japan, so not only was the food exemplary but their knowledge of the dishes served made the whole experience top notch. The selection of items was immense, with lots of small portions of an array of veganised (and sometimes naturally vegan) Japanese dishes. The Tonkatsu was made from freeze dried tofu which, if you’ve never tried it, is fabulous and I have since added it to my always in stock pantry list. 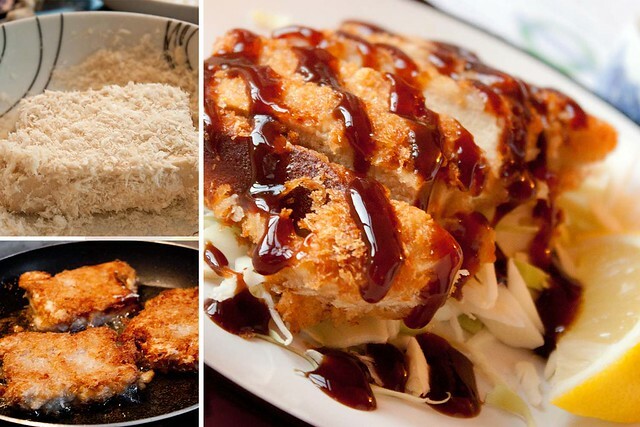 Here it is panko breadcrumb coated, deep fried, and served on a bed of shredded cabbage and topped with tonkatsu sauce and fresh lemon. It was a complete texturally mindblowing tastefuck, worth the cost of the meal alone. I’m so excited to have discovered this ingredient. One of the final dishes to come out was the takoyaki balls, Ed’s main culinary contribution to the evening, otherwise known as Ed’s Balls because we are all eight years old. 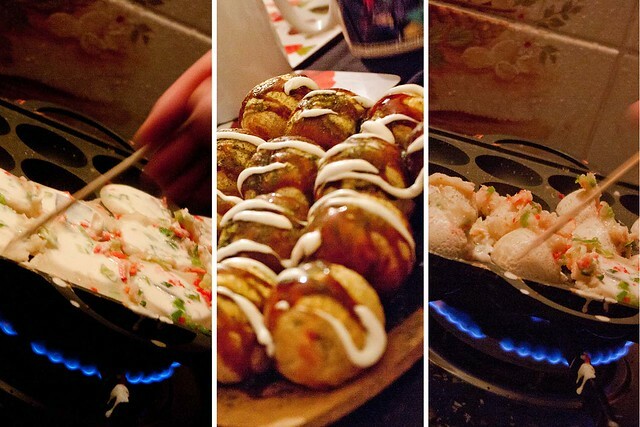 These doughy balls are cooked in a special takoyaki pan, where batter slowly cooks and in the process are turned to form the final product. Equally eggy in both flavour and texture (hey black salt!) 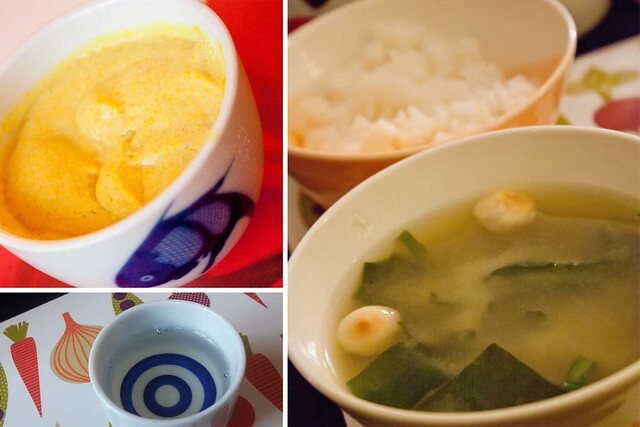 was the steamed egg pot, made with tofu. I’m a huge fan of turmeric, which is used to colour most faux egg dishes, hence I love all egg subs, the chawanmushi no exception. The miso and rice came out last, and I appreciated the order of this; when I was in China I noticed the plain rice always came last to act as a belly top up in case you were still hungry, a practise of which I approve regardless of cuisine. For a more in depth review, please check out Little Bird Suppers. And if you’re interested in Jhenn’s dinners then have a look at the events page (there’s a Tonkou Chinese night coming up next week if you’re interested). You won’t be disappointed. You can get in touch with Jhenn on Twitter or Facebook. This is my favorite post ever. All of it. Come to London and I’ll make sure there’s a supper club on for you!